Why do you think that the 4 electrode method is better ? 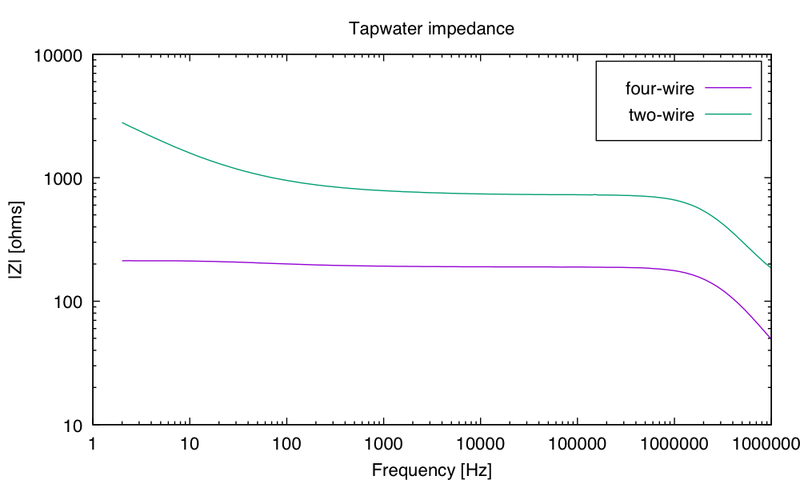 From the impedance vs frequency plot I can see that the impedance value is lower. How does this make the approach better ? Have you also plotted Nyquist plots for the measurements ? The 4-electrode method is flatter with respect to frequency—the electrolyte (water and ions) is basically resistive, all the capacitive effects come from surface chemistry at the electrodes. If we are trying to measure bulk properties of the electrolyte, then the surface effects are not signal, but undesired distortion. The actual value of the resistance is going to differ, because I do not have the same electrical field in both cases. For measuring ionic concentration, one always has to calibrate with a known concentration, to correct for geometric effects, in any case. Thank you for the helpful post for my experiment. 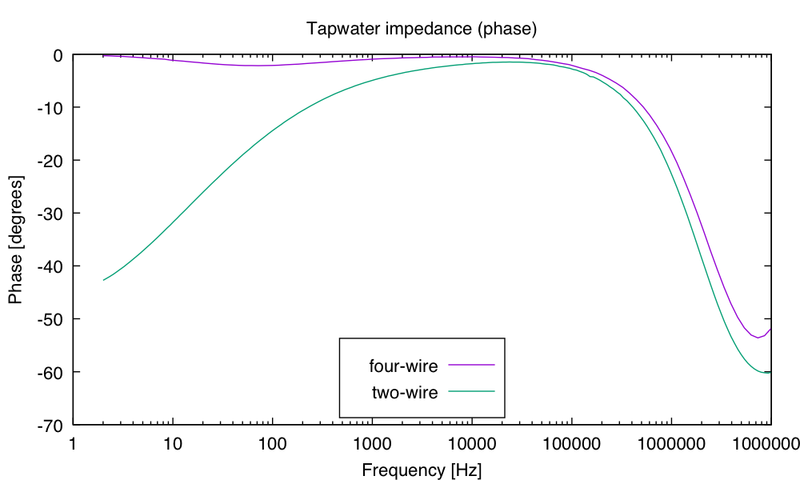 the 4 electrode method at the high frequency(> 100000 hz), Why are the impedacne value lower compared to value at low frequency? The impedance for electrodes in salt water can be roughly modeled as the conductance of the bulk salt water and surface effects that act like a thin insulating layer on the surface of the electrodes. That thin insulating layer can be approximately modeled as a capacitor with a resistor in parallel for the leakage through the layer. As the frequency goes up, the impedance of the capacitance goes down. An impedance spectrum that is flat out to a particular frequency then drops as constant/f can be well modeled as a resistor and capacitor in parallel.